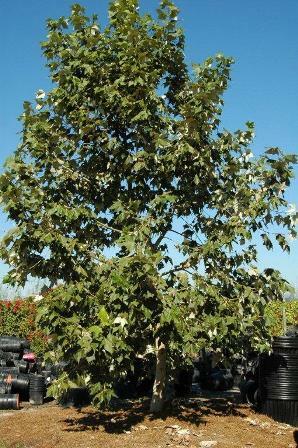 HABIT: Excellent large-growing deciduous shade tree. 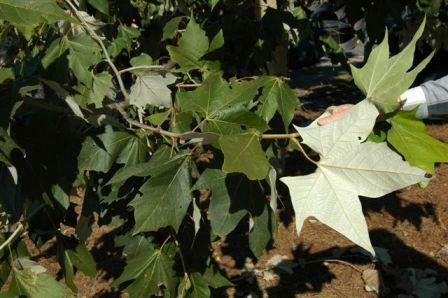 The large lobed leaves up to 8” wide are smooth green on the top but cottony white to silvery below. It has attractive exfoliating bark that is white in winter. It is well adapted to dry, rocky alkaline soils but adapts to moist soils as well, as opposed to the native sycamore (P. occidentalis). Height of 60 feet, spread of 40 feet. Pyramidal growth habit. Fast growing to a height of 60'-100'. CULTURE: Full sun partial shade and a little extra water during establishment. Under the organic program it has very few insect or disease problems. 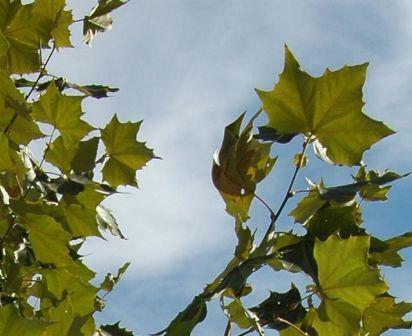 Our native sycamore is far more problematic. NATURAL HABITAT AND PREFERRED SITE: Native to northeastern Mexico. Will adapt to a wide range of soils. 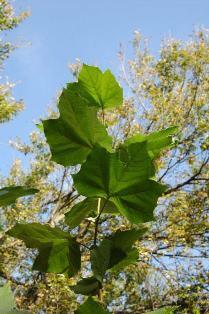 IDENTIFICATION INFORMATION: Leaves are broad about 8 inches across, with the margin having numerous teeth and slightly lobed. The foliage is a medium green on the supper surface and white on the underside. Foliage changes to yellow or orange if weather cooperates. FLOWERS AND FRUIT: Flowers are inconspicuous followed by rounded, bristly fruit on long stalks. TRUNKS AND BARK: Often are multi-trunked bearing smooth, mottled tan to gray exfoliating bark. NOTES: This tree is better than our native sycamore. Probably one of the best fast growing trees of all.